The World Trade Center site is a significant place for those who want to pay tribute to the lives lost in the events of 9/11 and gain some perspective regarding that fateful day. The 16-acre footprint in lower Manhattan includes an 8-acre memorial plaza dedicated to both the victims and survivors of September 11, 2001, and the February 26, 1993, terrorist attacks. The 9/11 Memorial opened on the 10th anniversary of the 9/11 attacks on September 11, 2011, with a ceremony for victims' families. The official opening to the general public was on the following day. The 9/11 Memorial includes the names of the nearly 3,000 victims of the September 11, 2001, terrorist attack on the World Trade Center and the Pentagon, and February 26, 1993, terrorist bombing in which six people died at the World Trade Center. 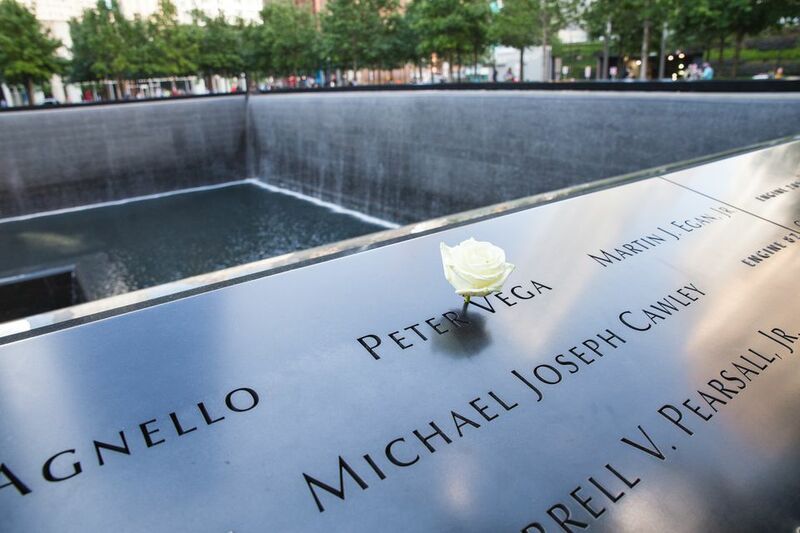 The twin reflecting pools, with the victims' names inscribed on surrounding bronze panels and the country's largest man-made waterfalls cascading down the sides, sit on the original site of the Twin Towers. The plaza surrounding the dual 1-acre pools includes a grove of nearly 400 North American swamp white oak trees. It is also home to a special Callery pear tree, known as the Survivor Tree because it flourished again after the 9/11 attacks left it burned and broken. The memorial site is open to the public with no admission charge. Early morning usually provides the best chance for some peace and quiet, before the full cacophony of city sounds intrude. The crowds typically thin out in the evening, and after dark, the water cascading into the reflecting pools turns into a shimmering curtain and the victims' inscriptions appear to be carved in gold. The 9/11 Memorial Museum opened to the public on May 21, 2014. The museum collection includes more than 23,000 images, 500 hours of video, and 10,000 artifacts. The atrium entrance to the 9/11 Memorial Museum houses two tridents from the steel facade of WTC 1 (the North Tower), which you can see without paying museum admission. The historical exhibitions cover the events of 9/11 and also explore the global mood leading up to the events of that day and their ongoing significance. The memorial exhibition displays portrait photographs of each of the 2,977 people who lost their lives that day, with an interactive feature that lets you learn more about the individuals. In Foundation Hall, you can see a wall from the foundation of one of the towers, in addition to a 36-foot-tall steel column still covered with the missing posters placed there in the days following the disaster. Rebirth at Ground Zero, an immersive film that follows the rise of the new World Trade Center, also has a permanent home at the museum. Visitors spend an average of two hours at the museum. Family members of victims enter for free, while visitors can pre-order tickets online or buy them onsite. The September 11th Families' Association put together the 9/11 Tribute Museum to pair those looking to learn about 9/11 with those who survived the event. The displays feature firsthand accounts from both survivors and victims' family members, as well as artifacts from the site, many on loan from the families of those lost on 9/11. Since the Tribute Museum opened in 2006, family members, survivors, first responders, and Manhattan residents have been sharing their personal stories on walking tours and in the museum's galleries. A tour is a good option for those seeking guidance while exploring the WTC site and Ground Zero. You can choose from both guided and self-guided tours, making it easier to get oriented and maximizing your time on the grounds. Tribute WTC 9/11 Walking Tours: Organized by the nonprofit September 11th Families' Association, these 75-minute tours are lead by people who have been directly affected by the events of 9/11. The tour may not be appropriate for visitors under 10 years old. Heroes of the World Trade Center Tour: Uncle Sam's New York Tours offers a 2-hour walking tour of the area, including a visit to St. Paul's Chapel, which served as a shelter for the city's rescue personnel during the events of 9/11. The World Trade Center site is located in lower Manhattan, bound by Vesey Street on the north, Liberty Street on the south, Church Street on the east, and the West Side Highway. You can access 12 subway lines and PATH trains from two convenient transportation hubs near the World Trade Center site. Lower Manhattan contains many historic sites, including Battery Park and the ferry to Ellis Island and the Statue of Liberty. Wall Street and the New York Stock Exchange anchor New York City's Financial District, and the famed Brooklyn Bridge, one of the country's oldest and most scenic roadway bridges, spans the East River to connect the boroughs of Manhattan and Brooklyn. Famous chefs and restaurateurs such as Daniel Boulud, Wolfgang Puck, and Danny Meyer operate locations in lower Manhattan, where you can also find city stalwarts such as Delmonico's, P.J. Clarke's, and Nobu.